Reserved instances are not actually physical instances, but a discount applied to the bill incurred from on-demand instances. AWS RDS reserved instance is one of the many other services that help you optimize your cloud cost. Therefore, you can reserve your instances since it is one of the best cost optimization practices. To avail the maximum benefits of reserved instances in the form of billing discounts, it is necessary to make sure that all your RDS reservation purchases have been processed by AWS. If payment status is pending or if the payment is not successful, then the user will be unable to get the optimization of his/her respective cloud infrastructure through reserved instances. Centilytics provides an insight especially for purchase status corresponding to your RDS reserved instances to ensure cost optimization. 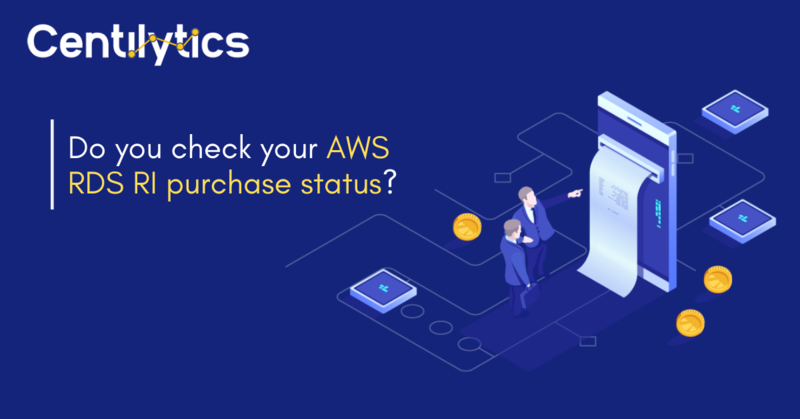 This insight helps you keep track of the purchase status of each one of your AWS RDS reserved instance and take necessary steps for the reservation made from AWS console. WARNING This indication will be displayed when payment of your AWS RDS reserved instance is pending. OK This indication will be displayed when payment of your RDS reserved instance is processed successfully. CRITICAL This indication will be displayed when payment of your RDS reserved instance gets failed. Resource Tags Applying resource tags filter will display those resources which have been assigned the selected resource tag. For eg- If the user has tagged some resource by a tag named environment, then selecting it from the resource tags filter will display all the resources tagged as environment. Resource Tags Value Applying resource tags value filter will display data which will have the selected resource tag value. For e.g. – A user selects a tag named environment with a value say production (environment:production). Hence, the data of all the resources tagged as “environment:production” will be displayed. You can use the tag value filter only when a tag name has been provided.